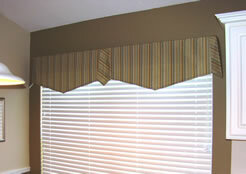 This simple window valance is made up of five separate pieces that are sewn individually and then stapled to a valance board. The design along the bottom, the “V” shape in this case, could be more elaborate, curved or simply flat. 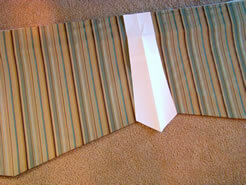 Have fun with your fabrics like I did with the tabs where the stripes go on the diagonal. All pieces are lined to help keep the shape of the window from showing through. I would probably put this valance in the beginner category for those of you who haven’t tried much sewing – I think you can handle this one! 1. 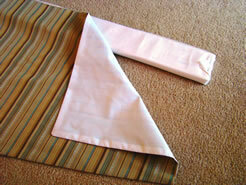 Start by determining the length and height of your valance, along with the shape. My window had two panes separated by mullions so I decided to make two main panels that were covered in the middle and on the ends with small tabs of fabric. I knew I was mounting my board 4” above the window so I measured down the distance I wanted the valance to hang to determine the length. The width was determined to be half the length of the board. 2. Because my two main valance pieces were narrower than my 54” wide decorator fabric, I was able to make both panels without piecing fabric together. This is the goal for a beginner! So I started by cutting the selvage edge off one side of my fabric. 3. 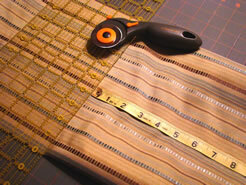 Next, measure across the fabric to cut the width required for your panel. My finished panel needed to be 38 ½ “ wide, so I added 5/8” for each seam allowance, left and right, and added 1 ¼” to my measurement and cut the width of the fabric at 39 ¾”. 4. 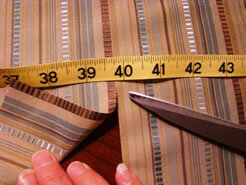 Once you have your fabric cut to width, fold it a couple times and measure out the length. Remember the cut length is the distance you want the valance to hang down from the board plus the width of the board plus 1 ¼” for seam allowanced top and bottom. 5. 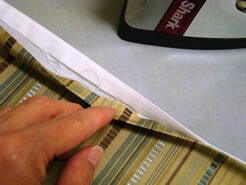 To make an angled cut along the bottom, fold the width of the valance in half, lay your cutting guide at the point along the fold and then along the other side at the height you want to cut off. I raised my guide up approximately 4” along the outside edge. 6. 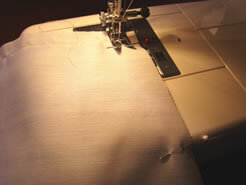 Cut the lining fabric to match the size and shape of the main fabric panel. 7. 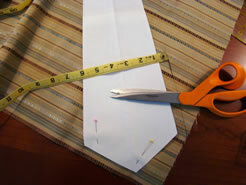 Pin the main fabric and lining fabric with right sides together. 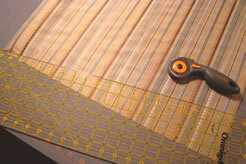 Leave a length of about 12”-15” unpinned along the top edge. This will be the opening to turn the panel right side out. 8. Stitch all the way around the panel leaving the opening unstitched. Clip the corners and turn right side out. 9. Iron the panel flat, and iron in the 5/8” seam allowance along the opening at the top. 10. 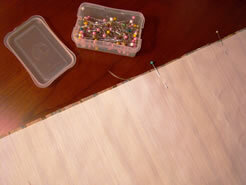 Cover the pine mounting board in lining fabric, using staples to keep it in place. Position the main fabric panels on the mounting board and staple in place. 11. Use a piece of paper to mock up your flaps. 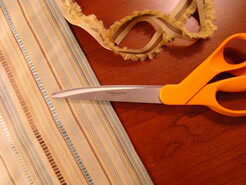 This comes in handy to get out the kinks before you actually cut the design out of your fabric. Plus, you will be making a template so pinning and tracing the design on your fabric will be a snap – just don’t forget to add seam allowances! 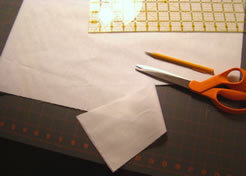 Notice here I am cutting 5/8: away from my template! 12. Cut a duplicate out of your lining fabric, pin the two together with right sides facing, and leave an area unstitched so you can turn the flap right side out. 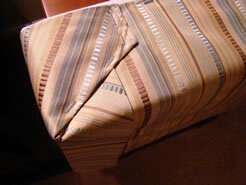 Make sure to clip the corners and iron flat then stitch the opening closed. Repeat steps 11 and 12 for the corner/ end pieces as well. 13. 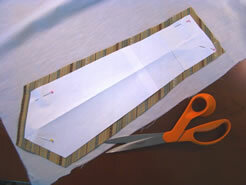 Attach the corner/ends and center flaps using staples. Then just install the “L” brackets in position above the window, using wall anchors to make sure they stay in securely. Center the board on the “L” brackets and attach by screwing from the bottom up through the “L” bracket and into the board. Last step is always to stand back and admire your beautiful work! This is just what I have been looking for! Thanks for the easy, step-by-step directions. May I say one more time- miss your show. The current HGTV shows are all about buying and renovating homes. A person updates much more often than buying! I miss ideas like the ones you give us here. Can anyone tell me if the show around the house is still in production or did it only show for two seasons? I loved them when they did room by room! We need more shows like this. HGTV doesn’t have a regular variety line up. Its one show with several episodes a day. They have lost their way. I love Matt and Shari they have a wealth of information. Hope someone can enlighten me on their current shows if still in production and if so what network? I can tell you what is happening with “Around the House”. We taped two seasons that have been airing for the past 2 – 3 years on public broadcast stations around the country and at times on CREATE TV. You have to check their website for airing times. 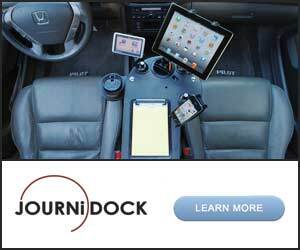 We are currently trying to find sponsors for another season of shows. Would we like to be doing room by room again? Absolutely. However, Matt and I can’t produce that show on our own because the format of room by room was extremely costly. We are listening to any and all suggestions! Hahahaha! I would be interested in help with my home. I have no sense of choosing colors or pieces to make that blend that is so important. It is just beyond me. We used to have a service called “Design By Mail” where you would send photos of a room and I would give you color, furniture layout and design ideas for a fee per room. Would you be interested in something like that? Small questions I can answer here, but when the project gets too large, it’s better to have it done on a more personal basis.